The planned closure of Wemyss Bay ferry terminal for major repairs has been postponed. The planned closure of Wemyss Bay pier for major repairs has been postponed for technical reasons. Caledonian Maritime Assets Ltd, which owns the facility, has announced that the work - originally due to start on Monday, March 2 - is now “most likely” to begin in September. The delay is due to problems with the new fendering system for the pier, which will not be manufactured and delivered in time to be installed within the original closure period. The major refurbishment of the terminal building, which started in January, is on schedule and will be completed as planned. The works encompass repairs to the pier structure, refurbishment of the linkspan, replacement of the berth fenders and dredging works. The complete closure of the pier is necessary to undertake these essential repairs, but technical issues with the new fendering system mean that the fenders will not be manufactured and delivered in time to be installed within the original closure period. Continuing with the planned closure from March would increase the duration of the shutdown, potentially meaning that the ferry terminal would be unavailable during the busy summer holiday period. CMAL’s senior civil engineer Brian Sydney, the Wemyss Bay project manager, told a public meeting in Rothesay in December that the new fenders were to be manufactured in China by a Dutch company. Lorna Spencer, CMAL’s director of harbours, said: “We very much regret that technical difficulties have led to us having to defer the start of the refurbishment works at Wemyss Bay until later this year. “This was not a decision we took lightly and we recognise that this will have a significant local impact and be a disappointment to people, passengers and businesses in the affected communities. CMAL is working with its suppliers to resolve the issues and expects to have a solution in place shortly. In the meantime, CMAL will increase the frequency of inspections of the current pier structure, linkspan and fenders. CMAL will hold public meetings in Rothesay and Wemyss Bay later in February to update on progress and discuss the issues raised by this delay. Details of these meetings will be published shortly. 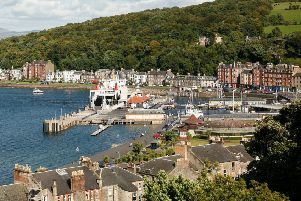 The operator, CalMac, still plans to run the Rothesay service to Gourock when Wemyss Bay pier is closed later in the autumn, and they will provide further details in due course, when the revised programme of works is agreed. The boat step replacement and shore works projects at Gourock were delayed slightly by adverse winter weather, but are due to be complete this month.